“Being the support act to Iron Maiden, we were placed pretty much up the front of what was a small stage when compared against the others we played on that tour. Perhaps it was such a small stage or that Maiden seemed to have a lot more gear than normal hence our equipment seemed to be shoved really close to the front of the stage. In some ways we didn’t mind, as there would be some good intimacy with the crowd. “I recall that whether it was constructed specifically for the show or another event, at the central section of the front of the stage the organisers had constructed a temporary make-shift stage extension where one or two of the bands could venture during the set to strut their stuff and shove the guitar necks towards the heavens. It was probably only about 3 x 1 metres. “What I failed to add is that the whole stage was pretty high, something like about 8 feet off the ground. At the base of this temporary stage construction I could see a few cross-braced scaffolding poles, which I trust were there to hold the thing up! “Then show time came on and there was a really healthy crowd, who you could see were really up for a good night and were in fine voice. We went through a few of the main numbers that were featured on the ‘Time Tells No Lies’ album such as ‘Children of the Earth’, ‘Panic in the Streets’ and ‘Lovers to the Grave’. The songs were going down a storm! “The more the crowd cheered, the more confident we became, and by this time I was merrily traversing between my dedicated part of the stage in front of the bass amp and the projected temporary section of the stage. On each occasion, I was so conscious of how high I was up on that stage and the relatively small passageway that existed for me to get between the section of stage in front of the bass amp to the super trooper section! “I reckon I did that perilous journey some 7 or 8 times during the set without putting a foot wrong … and I suppose almost becoming proficient, or so I thought! “Then perhaps it was due the sweat dripping down my forehead into my eyes or the euphoria of the night but reality seemed to get lost for that crucial moment. There we were now playing the final song of the set ‘Captured City’, which so many of the fans knew as it was the song that effectively got the ball rolling for us. “Those that are aware of the song will know that it has plenty of stop start sequences where you can get the crowd clapping and get them involved. It was those final few notes at the end of the song where I went for it, head tossed backwards and the guitar strap taken off so that I could raise the bass above me. With this action, unfortunately I took a step backwards and to my horror my foot didn’t land on terra firma! All the euphoria of the night was swept away in a millisecond and something in my head went “this is serious”! It must have looked like something out of a cartoon as one foot remained on the stage supporting my body, whilst the other jigged in mid air, desperately searching for something solid to achieve balance. 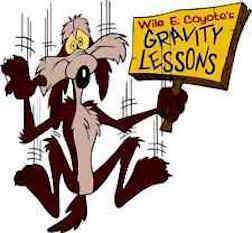 But reality was dawning on me as my body now began to arc backwards as, Newton’s law of gravity well and truly took hold! “As my body arched backwards, the only body movement I seemed to be capable of doing was to do swivel my body a little so that at least I could observe the horror that was unfolding … and see where I was going to land. It seemed to happen in extreme slow motion yet at the same time there just wasn’t a single thing I could do to save myself. “Now flying through the air, it was just a damage limitation exercise and I was hoping to goodness this wasn’t ‘goodbye world’ but if it was, it was a good way to go! Haha! “The sight of the scaffolding poles coming towards me was actually pretty terrifying and I still recall that vision vividly to this day! Then the horrible smash as the side of my head seemed to be the first thing that hit something hard and my eyes were still wide open to see the whole spectacle. It wasn’t the scaffold poles thank goodness but the lovely wooden parquet flooring of the hall which incidentally was very nice! The bass guitar also came crashing down almost in synchrony with my body and I saw a few machine heads fly off the neck and skate across the floor. My legs were tangled between the scaffolding so I looked like some sort of trussed up chicken! “Unbelievably, up above at stage level, this complete scenario seemed to somehow go unnoticed? How? The reason was that I had fallen down during the very last note of the last song of our set and the rest of the band had gone off stage via the other side so they didn’t notice by rather odd and painful stage exit. “As I laid there wallowing in extreme pain and self-pity, wondering exactly what damage I had done to myself (would I ever walk again?) I thought surely someone must have noticed what went on? “The crowd were still cheering us and I heard commotion above me and clumping of the boots on the stage as Tino and the rest of the band returned, no doubt with the objective to play an encore. I though surely they will have noticed that I am not there? 1, 2, 3 …. I heard Tino count in the song ‘The Ripper’, then suddenly he stopped the band and stated to the audience, “ Apologies, we seem to have a technical problem in that we have lost our bassist! At that stage a couple of roadies finally noticed the trussed up chicken and gradually untangled me from what could have been my scaffolding tomb! They checked me all over for any broken bones or back but miraculously there were none! Some guardian angel indeed must have been watching over me. The bass was in a very sorry state but somehow I had emerged relatively unscathed, albeit I ached for many weeks after and had plenty of bruises to prove my story to anyone that hadn’t witnessed it.